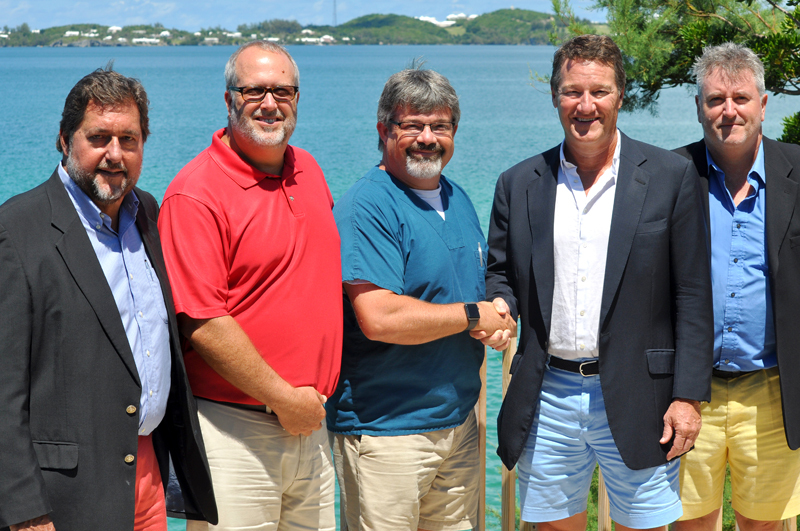 LOM Financial has committed to donating $50,000 to the Bermuda Zoological Society [BZS] over the course of the next 5 years, with the LOM donation set to specifically help support the BZS “Living Classroom” at Trunk Island and enable it to realise its potential as an Educational Outreach and Conservation training centre. BZS is the support charity for the Bermuda Aquarium, Museum & Zoo [BAMZ] and funds public outreach and education programmes for children and adults. With approximately 6,000 experiences from the education programmes each year, students are encouraged to become passionate advocates for conservation. Principal Curator, Dr. Ian Walker, said “BAMZ’s goal is to have every single upper primary and middle school student come to the island for an educational programme. We want to give every child a chance to enjoy and learn about this incredible place and hopefully develop a keen interest in our natural environment. Miguel Mejias is one such student who experienced the BAMZ and BZS educational system, starting at the age of 14. He went on to complete a Masters in the breeding biology and migration of Longtails and is now pursuing a PhD in Orinthology, concentrating on song birds, at Memorial University in Newfoundland. Reflecting on his experience at BAMZ, Mr Mejias said, “I started there as a shy, yet clownish 14 year old schoolboy who didn’t know much about anything…except that I loved animals. Dr. Walker added, “We are hoping to find Bermuda’s next environmentalists who will champion these causes as David Wingate and Jeremy Madeiros have. So programmes like the one at Trunk Island are vital in sparking an interest in our natural environment from an early age. For more information on BZS please visit www.bzs.bm or call 293-2727.